Penstemon pinifolius Mersea Yellow is an evergreen perennial with unusual coloured flowers for its type. Leaves are needle-like, pale green and around 1cm long. 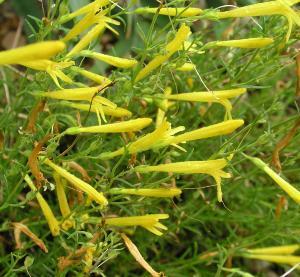 Flowers are long, tubular and lemon- yellow which are borne during the summer. Can be grown in full sun or partial shade. Height 0.35m.